has been certified by the Green Business Bureau as an environmentally responsible business. This business has reached the Green Member tier by adopting principles and practices that demonstrate a superior commitment to conserving the environment. The GBB is proud to recognize their contribution to making the environment a healthier place for their customers, employees, and community. We appreciate your continued support of ProSmoke and thank you for your commitment to sustainability. ProSmokes products are green certified and most include PET1 recycled materials for product and packaging. They also use certified vegetable based ingredients and sponsor, donate or organize numerous green intiatives. Designate your office as a smoke-free working environment, with outside smoking areas 25ft away from building entries. Assist at least one other business in learning about eco-efficiency and encourage them to join the GBB. Display the Environmental Compliance Poster (included in your Welcome package) in a visible location where your employees will be reminded of environmental laws and activities to green your business. Set computers to enter system standby or hibernate after 30 minutes of inactivity. Set monitors to enter sleep mode after 5 to 20 minutes of inactivity. Purchase paper towels and toilet paper made from 35-100% post-consumer recycled materials. Print and copy double-sided when possible, to significantly reduce paper use and waste. Eliminate paper, styrofoam, or plastic cups, plates and utensils in the kitchen area. Use mugs, dishes, and silverware instead. Create and adopt a corporate environmental sustainability vision statement. Test irrigation system to ensure proper orientation and water schedule. Ensure all spray heads are functioning and not spraying onto hardscape. Contact your local utility to conduct a commercial energy assessment (many times free) to pinpoint specific areas of energy waste. Inform your customers about your business' efforts to become environmentally friendly and follow green practices. Conduct a kick-off meeting to review the GBB Assessment results and recommended initiatives. Watch your GBB Welcome Video. Put together an office Green Team which will serve as the initial supporters of greening your business as well as enlisting and informing all employees of key activities. Obtain an assessment of your building's water use to identify specific water conservation ideas - many times this can be free from your local provider. 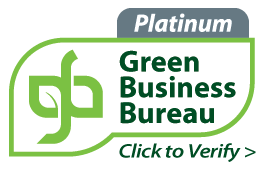 Purchase products and services from green-certified or Green Business Bureau vendors. Properly dispose of batteries, paint and chemicals, lightbulbs, and electronics. Install an ENERGY STAR programmable thermostat to automate your HVAC or A/C system. Recycle or sell your used toner cartridges. Use a green web hosting service for your business' website. This is typically available at the same price and is completely carbon neutral. Purchase recycled or remanufactured toner cartridges to realize significant cost savings. Reuse paper waste and have a scratch paper bin which people can use the back of unused printouts for drafts, scratch paper or internal memos, etc. Implement a policy to purchase used or recycled office equipment and furniture. Include "Please Consider the Environment" footer in all of your email signatures. Choose re-used, recycled, or FSC certified boxes and bags for retail use or shipping. Update the contact information on your company’s mailing lists regularly, to reduce wasted correspondence. Reduce junk mail by removing your business' name from national direct marketing databases. Complete the GBB Assessment to determine your current level of green activities, and get credit for things you are already doing. Purchase copy paper, folders, and other office paper products made from 30-100% post-consumer recycled materials. Replace regular light bulbs with Compact Fluorescent Light bulbs (CFL), that last longer and save energy. Purchase ENERGY STAR qualified electronic equipment, globally recognized as the most energy efficient equipment available in the market. Install timers on non-essential electrical appliances. Eliminate envelopes from marketing materials – use fold and mail when possible. Sign up to pay your bills online and receive invoices and receipts electronically. Use recycled content or low volatile organic compounds (VOC) paint products to improve indoor environmental quality. Use floormat/dirt-collection systems at doorways facing the outside space. Install water flow-rate controls (aerators) on faucets to reduce water waste. Use environmentally-friendly cleaning chemicals for daily use such as a non-toxic multipurpose cleaner or glass cleaner. Enroll in a waste exchange program where your waste can become another company's resource. Encourage employee carpools, public transportation, or bicycling as a means of transportation. Post schedules and route maps throughout office. Install light switch occupancy sensors in proper locations to automatically turn off lighting when no one is present. Donate a portion of your profits to an environmental cause. Install a filtered water tap at your sink or a water cooler for drinking water, instead of purchasing bottled water, to save money and reduce waste. Establish a paper recycling program. Paper includes newspaper, office paper, direct mail, white and colored paper, cardboard, envelopes, magazines, and catalogs. Purchase or lease copiers and printers that have a duplexing (two-sided copying and printing) function. Choose re-usable cleaning products like sponges instead of paper towels. Request that your payroll service eliminate the printed version of the pay stub and envelope. Ask them to email pay stub information instead. Expand your recycling program to also include: glass, plastic, and aluminum. "Tune-up" your HVAC or A/C system with an annual maintenance contract, ensuring use of non-ozone depleting refrigerants. Purchase trash bins and liners made from 35-100% post-consumer recycled materials. Offer incentive programs for the purchase of hybrid vehicles. Arrange the workspace to take advantage of areas with natural sunlight; design future spaces with natural lighting opportunities in mind. Install a smart irrigation controller that uses weather data to irrigate appropriately. Install sensor controls that turn off faucets automatically (motion sensors). Choose a pest control service that minimizes use of toxic pesticides to minimize negative health effects on building occupants. Designate car pool and hybrid parking spaces that are in preferred areas of your parking lot (e.g. closer to the building entrance or covered). Reduce air leaks with weather stripping and caulking around windows and doorways. Apply window film to reduce excess solar heat in the building. Replace all Exit signs with LED or high-efficiency alternatives. Change your HVAC or A/C filters every month or as required by the filter and HVAC or A/C manufacturer. Examine entire supply chain, including overseas suppliers. Eliminate unnecessary paper forms; instead use electronic forms when possible. Send and receive faxes directly to your computer. If not possible, eliminate fax cover sheets (use post-its on first page). Upgrade from older T12 tube lights with magnetic ballasts to more efficient T8 or T5 fluorescent lamp tubes with solid-state electronic ballasts. Establish a paperless billing program for your customers and encourage use by creating incentives. Replace inefficient or broken windows with double pane, low-E, energy efficient windows. Plant native, region-friendly plants to minimize the impact on the local habitat and to limit the amount of irrigation water needed. Complete a solid-waste assessment to help identify and quantify the items in your business' waste stream. Use rechargeable batteries, instead of disposable alkaline batteries. Use high-efficiency plumbing fixtures, like high efficiency toilets (HETs) and urinals (HEUs) to minimize water use and waste. Reserve one day a year when your company volunteers for local environmental or community projects (e.g., Habitat for Humanity, Earth Day, Save a Tree). Relax the office dress code to allow for attire that doesn’t require drycleaning. Also, encourage employees to make the switch to non-toxic dry cleaners. Develop a paper reduction policy, and conduct a paper reduction campaign. Use water-conserving cleaning methods and strategies while cleaning. Develop an energy conservation policy. Set up an office supply re-use center. Sell or donate unneeded furniture and equipment. Serve and encourage employees to purchase local, organic and fair trade food and drink. Minimize air conditioning needs with natural ventilation. Use air-filtering plants throughout the office to improve indoor air quality. Modify business practices to assure only rain is going down storm drains - not toxins. Use your lighting more efficiently with task lighting and daylighting. Reduce phantom “vampire power” loads. Use washable electrostatic furnace and air conditioning filters to reduce waste and improve indoor air quality. Optimize your servers and web hosting services. Use ceiling fans in place of air conditioning when possible. Green your meetings, conferences and parties. Use electronic proofs and recycled, non-toxic supplies/suppliers to create promotional materials. Purchase offsets for the travel emissions that can’t be reduced. Switch to green power from your utility. Paint the outside walls and the roof a light color. Use a cleaning company that purchases all-natural cleaning products, or insist that your current cleaning company use them. Add insulation and a timer to your hot water heater. Install a heat recovery system that converts waste heat to energy. Use fuel-efficient company cars, and schedule regular maintenance. Recycle unwanted cell phones and PDAs. Use telepresence or other long-distance communication to replace travel when possible. Become an annual sponsor of an event promoting sustainability in your area. Offer an office composting program for food waste. Place a company employee on the organizing committee for the same or another event to achieve maximum involvement and exposure. Become an active member of an organization that continually works to improve the environment nationally or in your area. ProSmoke has been certified by the Green America’s Green Business Network as an environmentally and socially responsible business. This business has reached the Silver tier by adopting principles and practices that demonstrate a strong commitment to conserving the environment and supporting social justice. The Green America’s Green Business Network is proud to recognize their contribution to creating and growing a green economy by supporting the needs of their customers, workers, the environment, and the community. We appreciate your continued support of ProSmoke and thank you for your commitment to sustainability. Assist at least one other business in learning about sustainability and encourage them to join Green America's Green Business Network. Include a sub-page on your website for green advocacy, education, information and resources links. Include a statement on your website describing your business's environmental standards, goals, and objectives. Develop a comprehensive labor plan to minimize the risk of worker mistreatment throughout supply chain. Actively support the cultural traditions of local communities in which your business operates along your supply chain (ex. offers regional and religious holidays off, and food that respects diets of workers). Use low VOC (volatile organic compounds) emitting paint on walls and ceilings in workspace. Use environmentally friendly cleaning products for daily use in the workplace, such as a non-toxic multipurpose cleaner or glass cleaner. Use natural odor elimination methods, i.e. ventilating with open windows, air filters, carbon odor eliminators. If power-washing or cleaning windows, driveways, or company vehicles onsite, use non-toxic cleaners to ensure only rain goes down storm drains. Use washable electrostatic filters in HVAC units. Purchase carbon offsets for greenhouse gas (GHG) emissions that can't be reduced. Ensure your green cleaning company or housekeeping staff cleans your office using green cleaning practices. Arrange for a single delivery, or try to group shipments of several items at once from your vendors. Use clean or low-emission company vehicles (including hybrid or electric), and schedule regular maintenance. Use ground shipping rather than air whenever possible. Bronze: Based on your specific industry, describe to us the major area of social and environmental impact (pick one for each) of your business and how you're currently addressing it. Bronze: Establish a process to receive regular advice/mentoring on how to improve your business performance. For a business that hires employees or uses interns/volunteers, establish a process for providing clear feedback on performance. Bronze: After completing the GreenGain assessment, analyze your current sustainability performance and develop a plan that prioritizes initiatives based on your results. Bronze: Create personal goals to help champion green initiatives throughout your company, or designate a green leader or Green Team for your business. Bronze: Develop a social and environmental mission and vision statement for your business and post it on your website. Bronze: Create and publish a clear return/refund/cancellation process for products and/or service contracts for customers/clients. Silver: Identify any major environmental sourcing concerns in your supply chain and address at least one with a clear action plan. (If you are a service-based business, please click 'Complete'). Silver: Recommend environmentally preferable products and services to all of your clients (If you are a product-based business, please click 'Complete'). Silver: Establish practices to support the development and training of your employees and/or interns/volunteers. If you have 0-1 employees, develop and implement a yearly plan for professional growth and development. Silver: Complete at least three initiatives in the "Supporting Your Community" category below. Silver: Install the display source code for your Green America Seal of Approval on your website. Gold: Describe your biggest new opportunity around social and environmental sustainability and how you plan to implement it. Gold: Develop a fair labor Code of Conduct and require written consent from your core suppliers (If you are a service-based business, please click 'Complete'). Gold: Implement policies that encourage employee job flexibility and work life balance. If you have 0-1 employees, develop and implement a plan to build stronger work life balance. Gold: Take a leadership role in an organization that continually works to improve the environment or social responsibility nationally or in your area. Gold: List the date your business first opened (must be in operation at least six months to earn Gold status). Silver: Identify any potential labor concerns in your workplace (service business) or supply chain (product company) and address at least one with a clear action plan. Eliminate paper towels, styrofoam or plastic cups, plates and utensils in the breakroom or kitchen. Use re-usable mugs, dishes, and silverware instead. Place bins at print and copy stations to store unused printouts for scratch, draft paper, etc. Use recycled or re-used boxes, bags, and general packaging for office mailings, shipping, marketing, and promotions. Reduce outgoing mail by updating the contact information on your business's mailing lists regularly. Reduce incoming junk mail by removing your business' name from national direct marketing databases. Enroll in a waste exchange program where your waste can become another business's resource. Establish a paper recycling program for newspaper, office paper, direct mail, white and colored paper, cardboard, envelopes, magazines, and catalogs. Use printers that have a duplexing (two-sided copying and printing) function, and print/copy double sided when possible. Establish a recycling program that includes glass, plastic, and aluminum. Eliminate unnecessary paper forms for administrative functions and use electronic forms when possible (ie. digital faxes, electronic receipts, digital pay stubs). Establish a paperless billing program for your vendors or clients. Responsibly dispose of hazardous items, such as CFL/fluorescent light bulbs, batteries, paint, and electronic waste. Work regularly with vendors to minimize product packaging. Install high-speed air hand dryers in restrooms at your facility. Centralize employee schedules and other announcements in a single location instead of printing paper copies (i.e. whiteboard, emails, etc). Use bio-based plastic retail bags that are fully compostable or light biodegradable. Eliminate all styrofoam in operations, including packaging or serviceware. Develop a paper stewardship and reduction policy, and conduct a paper reduction campaign. Set up an office supply re-use center and encourage materials sharing (I.e. rechargeable batteries, scrap paper, markers, etc.). Sell or donate unneeded furniture and office equipment. Use reusable or compostable catering supplies for business meetings and events (i.e. digital handouts, re-usable dishware and linens, or biodegradable flatware). Promote and sell reusable bags instead of plastic bags. Recycle unwanted equipment and electronics, such as computer monitors, hard drives, cell phones, PDAs, toner cartridges. Offer an incentive to customers who bring their own shopping bags, coffee mugs, etc. and/or use a disincentive such as charging a fee for disposable containers and bags. Donate old and unused merchandise and equipment to a local charity or non-profit organization. Return used clothes hangers to manufacturers or vendors for a rebate. Eliminate the use of plastic bags in your store (BPI certified compostable bags are acceptable). Redesign receipts to be simpler, made from recycled content, and BPA free. Offer customers an opt-out option for printed receipts or email digital receipt copies to their inbox. Offer digital coupons instead of printing coupons for distribution. Eliminate use of virgin plastic, polystyrene, or any other petrochemical-based packaging for your products. Conduct a lifecycle analysis of your core products to map the impacts from sourcing of raw materials to ultimate disposal. Use the most recyclable plastic available (lowest number inside the triangular recycling symbol), if using plastic packaging. Use recycled materials or biodegradable packing peanuts for fill in packages. Sell and stock products that are recyclable or made with recycled content or sell and stock less toxic products than conventional ones. Formulate an office purchasing policy to prioritize the purchase of used or recycled office equipment and furniture. Offer environmentally friendly gift-wrapping options, such as recycled wrapping papers, tissue paper, bags, and boxes. Sell gift cards made from recycled plastic and establish a gift card recycling service in store. Purchase folders, envelopes, notepads and other office paper products made from 35-100% post-consumer recycled materials. Reduce the amount of paper used in marketing materials by eliminating envelopes, using fold and mail, providing information electronically, etc. Regularly update your customers about your business' efforts to become more environmentally and socially responsible (i.e. through company newsletters, press releases, tweets, etc.). Share verification successes/challenges in monitoring your supply chain with your consumers. Publish an annual external report highlighting your performance on mission-related activities, including targets, results, and comparisons from previous year. Set computers and monitors to enter automatic standby or sleep mode after 20-30 minutes of inactivity. Contact your local utility to conduct a commercial energy assessment (oftentimes offered free) to pinpoint specific areas of energy efficiency. Use a green web hosting service for your business's website. Purchase ENERGY STAR qualified electronic equipment and appliances, an indicator of more energy efficient equipment. Design your office with day lighting in mind (i.e., take significant advantage of natural light with sky windows, skylights, etc.). Replace older light bulbs with compact fluorescent lamps (CFLS), light emitting diodes (LEDS), and other more energy efficient light bulbs as they burn out. Use your lighting more efficiently with daylight dimmers and/or task lighting. Reduce phantom vampire power loads by installing after hour timers on non-essential electrical appliances or using smart power strips. Optimize your servers for energy efficiency. Use ceiling fans and cross ventilation in place of air conditioning when possible. Use energy efficient cash registers or Point of Sale (POS) terminals. Replace Open/Closed signs or any other outdoor lighting with LED or high-efficiency alternatives. Use energy efficient display lighting, utilizing the best possible lighting options for window displays, display cases, and cabinets. Retrofit parking lot lighting and streetlights to significantly reduce maintenance and energy costs. Implement on-site renewable energy production (solar, wind, geothermal, etc.) at your office or facility. Test irrigation systems to ensure proper orientation (avoiding pavement) and water schedule. Install low-flow aerators on faucets and showerheads or sensor controls that turn faucets on and off automatically. Plant native, region-friendly plants to reduce irrigation and minimize the impact on the local habitat. Use high-efficiency plumbing fixtures, like high efficiency toilets (HETs) and urinals (HEUs) to minimize water use. Use water-conserving cleaning methods when possible (i.e. sweeping instead of mopping and hosing). Harvest rainwater to water your landscaping efficiently. Set up a greywater system to reuse sink water in toilet systems or outdoor irrigation. Regularly review your marketing and promotional materials to ensure there is no use of negative stereotypes. Actively participate in advocacy or lobbying work to raise awareness around environmental and/or social issues. Regularly educate yourself on the progress of responsible environmental and social practices in your industry. Purchase supplies and/or materials from green-certified or Green America certified companies. Donate a fixed portion of your profits to a social or environmental cause. Become an annual sponsor of an event promoting sustainability and social justice in your area. Become an active member of an organization that continually works to improve the environment and social justice, nationally or in your region. Develop a policy outlining your commitments for partnering with or giving back to local communities. Clearly disclose all animal ingredients in the products my business sells. Include instructions for disposal of packaging or information on how to recycle. Provide an industry-leading performance guarantee/warranty for your product or service. Use Fair Trade or organic coffee, tea, and sugar in the office.